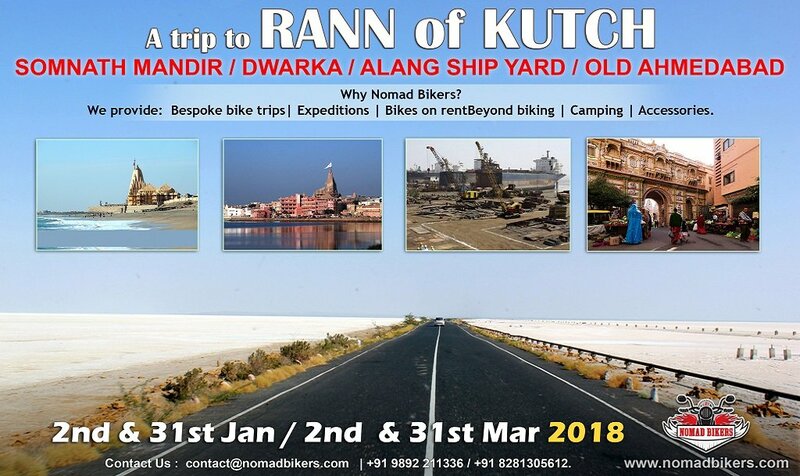 Book a Motorcycle Tour with Nomad Bikers. We specialize in arranging Royal Enfield Adventure Motorcycle expeditions and safaris in the Himalayas and in other parts of India. 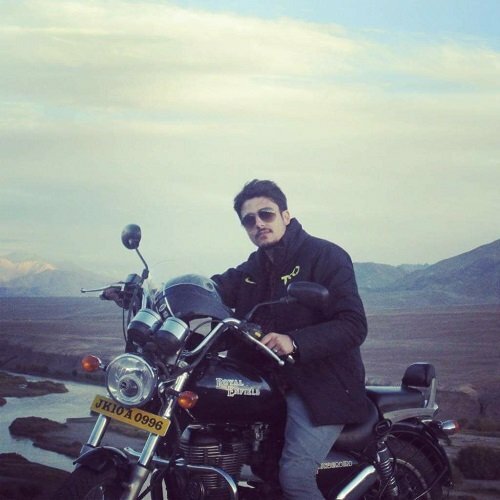 You can enjoy guided motorcycle tours with us to many places in Leh Ladakh, Himachal, Rajasthan, Rann of Kutch, Deccan, Goa, Bhutan, Nepal and others. We have Himalayan motorcycle trips and other motorbike tours in India, Nepal and Bhutan starting from various places like Delhi, Shimla, Srinagar, Manali, Chandigarh, Jodhpur, Mumbai, Goa etc. Our road trips have carefully designed trails that takes you to some of the most scenic landscapes, highest mountain passes, remote villages, oldest monasteries, majestic forts and many more. We have well-maintained troops of all the models of the legendary Royal Enfield motorcycles in various places in India. You can choose any model that suits your taste and style for your trip. You can also rent or buy motorbike riding accessories from us. We have a wide range of accessories like riding jackets, helmets, riding gloves, boots, riding armours in many sizes. Our customers also have the option of booking a custom tour with us, wherein they can design their own itinerary. We help you design your custom tour which takes care of your preference for places, vehicles, time frame, budget etc. and	also provide you with a road guide to help you along the route. 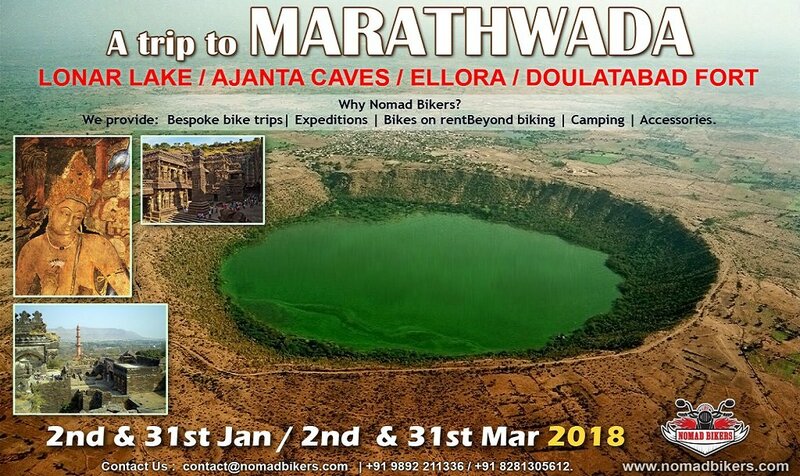 If you are one of those adventure seakers who like some extra adrenalin boost during the rides, we also provide option of participating in various adventure sports like paragliding, river rafting, rapelling, zip-line, trekking etc during the trips. You can also choose to stay in camps during the motorbike tours. For those who like to explore the extremes we also have some extreme weather expeditions, which are guided tours arranged during the chilly weather of winter through snowfall. We also provide motorbike rental services wherein you can rent any model of Royal Enfield motorcycles from us for certain duration of time for your personal trip or use. You can hire motorcycle for either half day or full day. This service is available at some major cities in western and northern India. Chhitkul is the last inhabited village before the	Indo-Tibetan border and the highest village in the Baspa valley. 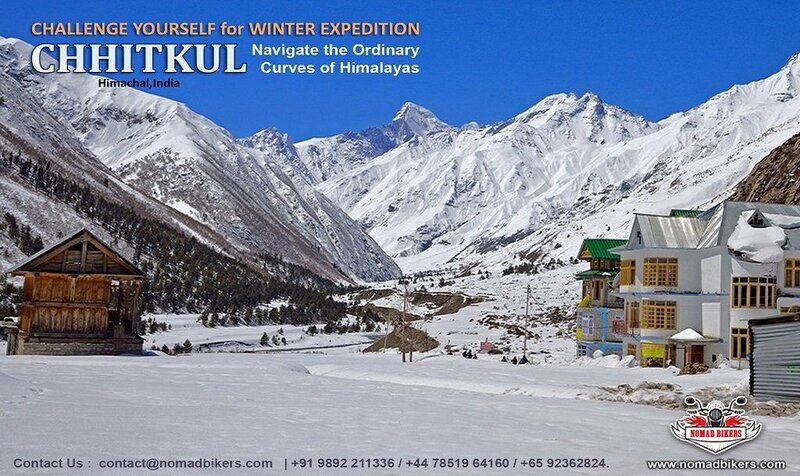 Completely coverred in snow during winter, it is a definite challenge for any adventure motorcyclist. Kalpa is on the route from Shimla to Spiti. In winter Kalpa is coverred in snow and the roads beyond is sometimes closed due to heavy snowfall. The snowy valleys and challenging roads is an experience of a life time. When we decided to take a trip to Stipi on motorcycle, we evaluated many trip organizers before zeroing in on the Nomad Bikers to guide us along the trip. Initially I was a little sceptical. But the whole trip turned out to be awesome. Bikes were in excellent condition. Accessories were brand new and comfortable. Night stops were at good places. They themselves were a great team - very enthusiastic, knowledgable and helpful. Got to visit some of the most breath-taking places in Himachal. Overall it was much more than what we had expected and will definitely recommend Nomad Bikers to everybody. 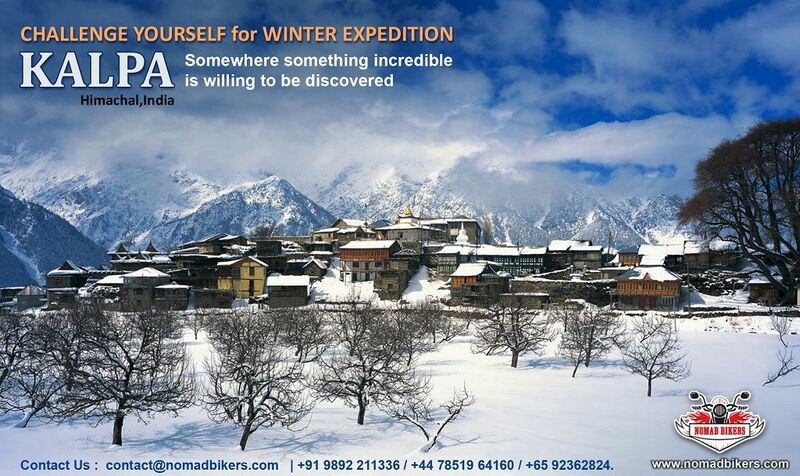 It was great travelling with NomadBikers on their trip to Spiti. Very proffesional in their dealings. They take care of everything during your journey so that you can travel hasslefree. Lovely campsites at Sangla. Planning for the next ride with NomadBikers to Sach Pass.